What is a baby’s experience in childbirth? MotherBirth will show you. 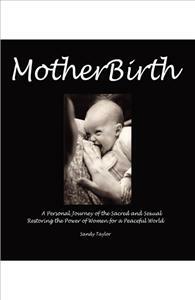 MotherBirth’s author tells her compelling story of a natural, ecstatic, and orgasmic birth once the psychological impact of her own birth trauma and subsequent infertility was healed. As a professional photographer, Taylor documents what's possible. Having relived, witnessed, and photographed birth, bonding, and rebirthing, her experience and passion quite literally reveal the masterful way a deep loving mother-baby bond generates well-being and intuitive communication. This moving, sacred journey illustrates how a culture of welcoming mothers and babies holds the potential to transform our world: one mother-baby at a time. What is a baby’s experience in childbirth? MotherBirth will show you.